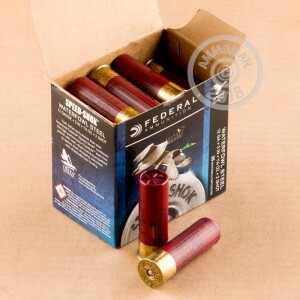 If you're looking to stock up on ammo for your next duck hunt, this 12 Gauge Speed Shok load by Federal is just what you need! These 3" 1 1/8 oz. #2 loads feature uniformly round steel pellets for tighter shot patterns. The wad is high density and efficiently seals propellant gases, making the knock-down power of these load tremendous. High output primers also contribute to their reliable, hard hitting results. You also don't have to worry about weather affecting your performance, as these loads will perform well in any climate. 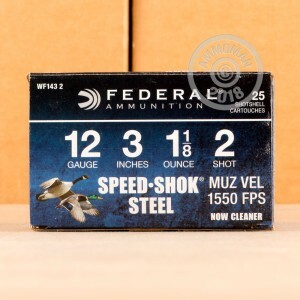 The muzzle velocity of the 12 gauge 3" Steel Shot Waterfowl Load is 1550 feet per second. Your 25 rounds will be delivered to you in brand new condition for a very reasonable price! Federal brand ammunition has been around since 1922. Manufacturing takes place in Anoka, Minnesota where they produce shotshell, centerfire and rimfire ammunition. Many of their products have won awards from the most prestigious organizations in the industry.